My grandmother would be 136 on January 4. She was a different type of Grandma than I am to my nine grandkids. I picture Granny in a silk bed jacket and hairnet, reading a magazine in bed. I remember sucking a Pine Brothers honey drop that she handed me from the box on her beside table, but I don’t recall ever snuggling with her under the covers as my grandchildren did with me. They nestled on my lap while I read them endless stories. Granny gave me books as gifts when I was young, and we discussed literature when I was older, but I don’t believe I ever sat on her knees to listen to a story. My grandchildren taught me Chinese jump rope, and I have taught them to play casino and to paddle a solo canoe. We have played dolls and jacks and Frisbee. Granny taught me to cross-stitch and to play gin rummy, but I’m positive she never sat on the floor to build block castles with me as I did with my grandchildren. Not cuddly, playful, or especially demonstrative, my grandmother had other merits. The summer I was ten, Granny took my sixteen year old cousin and me to Alaska. My diary entries from that twelve-day trip are basic: “Today I saw a totem pole.” “Today I saw a glacier.” “Today I played shuffleboard with Ellie.” I recall staring out a train window at scrubby bushes and stubby grass as we wound through the mountains between Seward and Anchorage. I remember seeing the loop-the-loop train tracks from a low-flying pontoon plane that barely held the three of us and the pilot when we flew back to Seward, most likely my first-ever airplane ride. What a thrill to land on water. Less thrilling was my parents’ dismay when they later learned that Mother’s mother, whom they had entrusted with the safety of their daughter, had taken me on a single-engine plane in far-off, pre-state Alaska. Quite the adventurer, my Granny at seventy-one. A dozen years later, Granny convinced my aunt and uncle to accompany her to Paris “on their way” from Seattle to my Atlanta wedding. As long as they were crossing a continent, why not cross an ocean as well? As my uncle told the story, Granny groused about fatigue in the Louvre, but when the elevator doors in Le Bon Marché department store didn’t open the minute she pressed the button, she marched over to the stairs and climbed all the way to the third floor. A determined woman, my Granny at eighty-three. In Spring 1977, I telephoned her in Atlanta where she was visiting my parents and flattered her into changing her return ticket to stop off in Rochester “on her way” back to Seattle. She made it a point to spend time with each of her five Rochester great-grandchildren. She admired Rachel’s dancing, praised Ruth’s piano playing, and invited Miriam, a first grader, to read to her. She listened attentively to Paul and Larry talk about the new-fangled computers that intrigued them both. That night, as my husband Julian drove her and her caregiver/companion to the motel, she said, “Those computers seem interesting. If I were just a little younger, I’d have to learn about them.” Still open to the world, my Granny at ninety-nine. At her 100th birthday party, guests presented four separate letters from the White House wishing her well on her landmark day. “I guess I’ll just have to vote for Carter in the next election,” Granny said. And indeed, she did vote in the next election, but most likely for Reagan as she was a lifelong Republican. We had a long phone conversation during that primary season, discussing whether a vote for John Anderson would be a wasted ballot. Still a proud and informed citizen, my Granny at 102. One day, as a friend and I entered a restaurant with Granny, Mary turned to her. “I was the youngest of seven children, and my brothers and sister all spoiled me. Then I married a wonderful man, and he spoiled me. After he died, my children and my friends spoiled me.” She paused, then concluded with a flourish, “And I thrive on it!” Demanding attention, my Granny at any age. 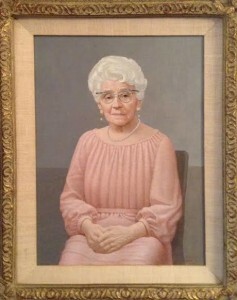 The artist’s interpretation of Granny. rose. The artist softened it into old lady pink. Not my Granny. She spoke her mind and insisted on being spoiled throughout her 103 years. She was demanding, imperious, and, in her son-in-law’s words, “a tough old bird.” That was my grandmother, and I loved her. 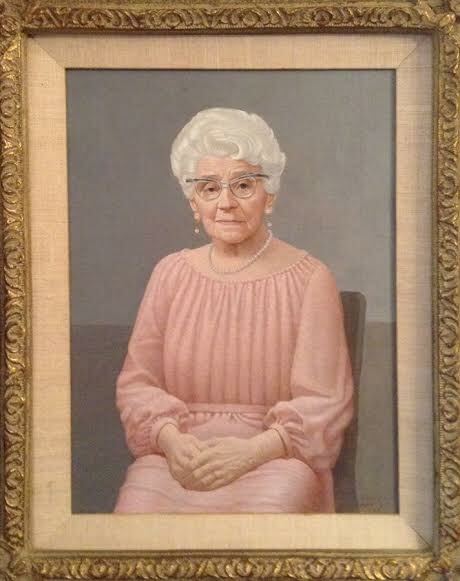 Here’s looking at you, Granny! 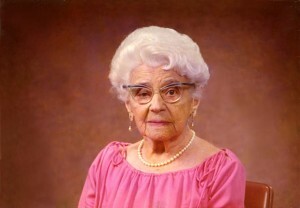 Granny as she dressed herself for her 100th birthday portrait. may granny’s blessings from above reign on all her family. yasher koach to granny and the lovely memories she shares with you.